Colleagues and Friends, The Philippines is hosting the Asia Pacific Economic Cooperation this year, with a slew of about a hundred APEC-related meetings—many of them in Philippine cities like Manila, Cebu, Iloilo, Tagaytay, and Clark Freeport—and culminating in APEC’s annual Economic Leaders’ Meeting to be held in Manila in November. APEC hype has started to grip media attention, at a time when the Filipino people are reeling from the impact of the severe crisis and renewed offensives of global capitalism under the neoliberal policy regime. The Filipino youth, in particular, have been feeling the brunt of the crisis affecting the domestic economy and educational system. The masses of students and their families are staggered by the rising costs and deteriorating quality of education, and by the severe unemployment that faces them once they look for jobs. They are thus keenly interested in how these problems are in fact being worsened by so-called reforms in Philippine economic and educational policies, which in turn are directly linked to the neoliberal offensives and APEC. APEC claims to promote economic cooperation among the countries of the vast Asia-Pacific region. Indeed, its 21 member-states are home to nearly 3 billion people, account for 60 percent of the global economy, and thus hold tremendous collective potential for socio-economic development and interstate cooperation. However, APEC’s record since its founding in 1989 shows that its big-business orientation, neoliberal agenda, and major policy directions have mainly advanced the dominant interests of developed countries led by the United States and Japan. Consistent with the US-initiated Washington Consensus, APEC has aggressively pushed the key components of neoliberal globalization, namely trade and investment liberalization, deregulation, privatization and denationalization, into more than half of the globe. In fact, APEC’s 1st Economic Leaders’ Meeting (ELM) in 1993 was called by the US to help jump start the stalled WTO Uruguay Round and try to break the resistance of underdeveloped countries in piecemeal fashion. This was quickly followed by the so-called Bogor Goals adopted by the 2nd ELM in 1994, which explicitly aimed for establishing trade and investment liberalization in the region—by 2010 for developed-countries and by 2020 for underdeveloped countries. Since then, APEC has served as a platform to coordinate the interests of developed countries, build consensus (if not fully resolve conflicts) among them especially on free trade, investments, and finance, and lure underdeveloped countries deeper into the neoliberal trap. 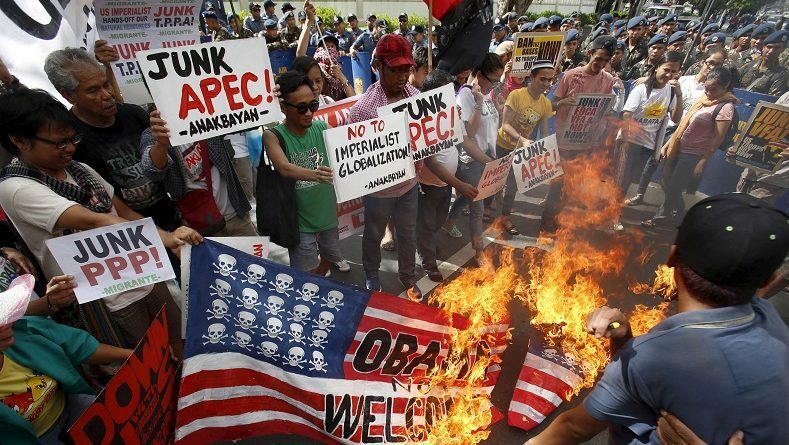 The US, as one of the original members, has consistently used its clout within APEC to bully other member-countries into submission and thus maintain its overall hegemony. On the surface, APEC is supposed to build voluntary and non-binding consensus among government representatives through annual meetings. Behind the scenes, however, the APEC Business Advisory Council and Business Summit act as channels for powerful corporate lobbies. They work hand-in-hand with various APEC committees, such as the Committee on Trade and Investment, which are also staffed by big bureaucrats, technocrats, and corporate appointees. The APEC mill grinds a continuous output of policy research and detailed guidelines and recommendations representing consensus across the political and economic elites of Asia-Pacific, which are then given imprimatur in the annual ELM. This year’s APEC theme, “Building Inclusive Economies, Building a Better World,” merely repeats the deceptive post-2008 mantra “Reform Agenda for Inclusive Growth” of the World Bank, also parroted by the Asian Development Bank. Behind such saccharine slogans as “democratizing the fruits of economic growth,” “fostering SME participation in global markets,” “investing in human capital,” and “building resilient communities,” the topmost agenda items for APEC 2015 continue to revolve around regional economic integration (REI) into the neoliberal framework. These priority items include advancing proposals towards a Free Trade Area of the Asia-Pacific (FTAAP); the Strategic Blueprint for Promoting Global Value Chains (which represents the core of economic integration); the Accord on Innovative Development, Economic Reform and Growth (which represents a broad set of economic “structural reforms” and “innovations”); and the Connectivity Blueprint for 2015-2025 intended to ensure the “seamless flow” of people, information, and trade (especially in services) throughout the region in the service of US-led monopoly capitalism. The FTAAP, first conceptualized in 2006 and further explored in 2010, is being proposed by APEC as a comprehensive and binding agreement on “next generation” trade and investment issues that will support the WTO and advance the goal of REI. In APEC’s so-called Beijing Roadmap drawn up in 2014, the FTAAP is supposed to be formally negotiated outside of APEC but backed up by APEC’s consensus-building processes. So far, two major pathways to the FTAAP are being proposed: the US-led Trans-Pacific Partnership, which calls for a high level of regional integration and includes many Asia-Pacific countries but not China; and the ASEAN-based Regional Comprehensive Economic Partnership (RCEP), which is a looser form of integration and includes China but not the US. The TPP and RCEP are in a race to be chosen by APEC as the main template for the FTAAP. But it remains possible for APEC to adopt a hybrid FTAAP that includes parts of the TPP and of the RCEP, and thus become a binding framework for US-China cooperation and competition in this part of the world. There are efforts to make all APEC countries also members of the FTAAP, and suggestions to expand APEC’s membership, thus making the FTAAP even more all-encompassing. The APEC is thus an important arena of both continuing collusion and growing conflict between two imperialist powers, the US and China, at the expense of weaker and smaller countries. The US-led bloc (which includes Japan, Canada and Australia) continues to enjoy the upper hand worldwide and is determined to complete the TPP talks and the US pivot to East Asia. China, on the other hand, is fortifying its own position by cementing closer political and economic ties with Russia, India, and other South Asian states and Central Asian states inside an expanding Shanghai Cooperation Organization, and globally through the newly launched BRICS Development Bank. Despite its own internal problems, China continues to extend its powerful economic clout inside and beyond the region by setting up the Asian Infrastructure Investment Bank with 49 other countries in Asia-Pacific, Europe, Africa and Latin America. When it is fully established by end-2015, AIIB may rival or complement the IMF as a new imperialist tool that China can wield to mobilize resources for its own hegemonic ambitions and to dictate the terms of inter-regional integration and connectivity, especially through its grand Silk Road project. Whether the US-led TPP version or the China-friendly RCEP version dominates the process, and even before final agreement is reached on the FTAAP, APEC is already putting in place the building blocks of regional economic integration from one year to the next. While the documents it spews out are supposedly non-binding, they are already being implemented by member-states and big business in “follow-the-leader” fashion. Essentially, the TPP is being sneaked in through the backdoor in some modified form. The result will be a fait accompli setup that more thoroughly liberalizes trade and investments, destroys remaining vestiges of national protection, and opens up the human, capital, and natural resources of underdeveloped countries and peoples in the Asia-Pacific to exploitation by the US and other dominant capitalist powers. Riding on the slogan “Building Sustainable and Resilient Communities,” APEC is using the supposed goals of “resilience, sustainability and food security” to justify the tighter integration and interlinking of Asia-Pacific countries. It is pushing for the further tightening of the TNC-controlled global production and supply chains, corporate-driven infrastructure connectivity, and other regional cooperation schemes. Food security and climate resilience are used to justify corporate control of Asia-Pacific marine and coastal resources through so-called “Green Economy” and “Blue Economy” initiatives. Riding on the slogan “Fostering SME Participation in Regional and Global Markets,” APEC aims to further entrap small and medium enterprises into imperialist REI and FTA schemes, turn the most successful ones into export-oriented and import-dependent sweatshops under TNC control (as components of the so-called global value chains), and undercut independent national industrialization. APEC’s economic agenda includes the neoliberal scheme to “reform” the educational system of its member-countries so that these are better aligned to supply the skilled-labor, professional, scientific, and ideological-cultural needs of the global capitalist system and its imperialist overlords. The “Education for All” (EFA) decade, launched in 1990 and reiterated in the Dakar Framework of Action at the World Education Forum in 2000, was quickly hijacked by the World Bank and other UN agencies. Since then, the developed countries have been implementing neoliberal reform in their own schools and pushing for its worldwide implementation. The Dakar Framework is so steeped in neoliberalism and UN superficiality that even international NGOs like Oxfam, ActionAid, and Education International are critical of it. Behind the EFA façade, the UN commitment is limited to Millennium Development Goal (MDG) Target 2A which states that by 2015, “children everywhere, boys and girls alike, will be able to complete a full course of primary schooling.” This target, which does not even address the quality of education and does not cover secondary schools, has not been achieved. Some 58 million children of primary-school age (9%), and 63 million adolescents of secondary-school age (17%) are out of school. Out-of-school rates may have dropped from 1996 to 2006, but they flattened out from 2007 onwards. An alarmed UNICEF stated that, at current rates, it would take another 200 years to achieve MDG Target 2A. Rather than ensure universal basic education, neoliberal school reform is focused on the corporatization of higher education, and on re-gearing of primary and secondary schools to supply the skilled labor needs of global capitalism. It pays lip service to education as a universal right, but its focus is not on delivering education as a social service but as a marketable commodity. Commercialized education has long been a coping mechanism for many poor countries, but neoliberal school reforms from the 1980s onwards have made commercialization far worse. Curricula, teaching methods and materials, and grading and testing systems have been revised to better suit the needs of big business and global production chains. Students are made to compete for high grades and exam scores, in order to sell themselves at a higher price in the skilled-labor market. Schools and teachers are also made to compete, with global academic standards and rankings in mind, to sell themselves and their services at higher prices. Academic globalization is often presented in glowing terms. Local universities are supposedly given better chances to compete in global rankings, accept more international students, send their brightest graduates to North America, Europe, Japan, and elsewhere, and partner with world-class universities and TNCs. However, only a few of them succeed. The bulk of schools remain as diploma mills for churning out a skilled labor force and rank-and-file professionals. Neoliberal school reforms lead to reduced government spending on public education and increased privatization. State universities, colleges and other public schools, as well as supposedly non-profit private schools, are increasingly operated as profitable businesses, often in partnership with big business. This leads to distorted academic priorities, higher tuition fees, violation of teachers’ rights, and worsening social inequities. To increase their own competitiveness and profitability, colleges and universities focus on the more lucrative programs and trim off those considered marginal or critical (such as in the humanities). They commercialize their lands, buildings, research outputs and other knowledge resources. They cram more courses into a year and shift to trimesters to produce graduates at a faster rate. They squeeze blood from their students and faculty to the last drop by increasing tuition fees and teacher workloads, by stricter requirements on student grants and loans, and by limiting the salaries and benefits of teaching and non-teaching staff. Finally, all these measures are imposed from above, through bureaucratic processes conducted behind closed doors by politicians and World Bank- or corporate-funded consultants. Meanwhile, the roles of academic and non-academic staff, parents and students in conceptualization, planning, and implementation are minimized. Campus protests against such reforms are hosed down with anti-Left propaganda if not outright fascist repression. In the Philippines, the so-called Kindergarten to Grade 12 (K-12) program—the Aquino regime’s centerpiece initiative in basic education—is a clear example of a neoliberal school reform gone terribly awry. Under the Enhanced Basic Education Act of 2013 (R.A. 10533), the old 10-grade basic education system (six in elementary school and four in high school) will be replaced with a 12-grade system (with an additional two years of senior high school) plus required kindergarten. Behind the catchword of “catching up” with global standards, the aim of Aquino’s K-12 program is to align the country’s educational system more fully with the global capitalist system and to compete better with other underdeveloped countries by producing a huge reserve supply of skilled labor for the world market and particularly for the Asia-Pacific region to keep down salaries and wages. These arguments fall flat because they mostly depend on the false premises and failed promises of neoliberal globalization, and on the simplistic notion that Filipinos should join the global K-12 bandwagon because everyone else is already on it. They disregard other studies that show no clear linkage between the quantity of learning time and the quality of the learning process. They disregard the fact that many countries have been on K-12 for decades yet remain grossly underdeveloped and fare even worse than the Philippines on educational indicators. They cannot even explain why, despite not going through K-12, Filipinos are among the most numerous, better-educated and willing to take lower pay and are thus the most sought overseas workers. In truth, Aquino’s K-12 is one of several educational reforms required by ASEAN Integration, as recommended by the SEAMEO INNOTECH and the ASEAN Mutual Recognition Arrangement (MRA) Projects, to encourage labor migration but at the same time to set educational and professional standards for cross-border employment within the Southeast Asia region. Aquino’s K-12 is driven in very specific terms by the US-led Washington Accord and Europe’s Bologna Process, which are meant to recognize or accredit only those professionals (or engineers in the case of the Washington Accord) that have undergone 12 years of basic education. It is also driven in more general terms by the Education for All Agenda (EFA) of the World Bank and the UN’s Millennium Development Goals (MDGs). In the K-12 system, high school (especially the last two years) will focus on specialized and technical skills that the global labor market seeks. A sampling of the so-called Technology and Livelihood Education (TLE) for Grades 7-10, and Tracks/Specialization for Grades 11-12, include such learning modules as housekeeping, plumbing, welding, tailoring, caregiving, carpentry, beauty and nail care, bread and pastry production, and so on. Instead of undergoing comprehensive basic education to prepare themselves to become productive members of Philippine society, the majority of the Filipino youth are now expected to prepare themselves to become the maids, caregivers, cleaners, restaurant waiters, hotel orderlies, hairstylists, plumbers, welders, carpenters, and bakers of the world. On the other hand, K-12 and other neoliberal school reforms deemphasize patriotic education, consciousness and culture. In universities, courses or subjects on Philippine history, Filipino language and literature and on Philippine government and constitution have been trimmed down. In high school, class hours devoted to Philippine social studies (Araling Panlipunan) will also be reduced, and its curriculum restructured based on themes derived from the US National Council for Social Studies. What is ironic is that Aquino’s K-12 cure will make the ailment worse because it has been wrongly oriented, poorly planned and underfunded, with signs that it will be shabbily implemented, and will have many adverse impacts that could have been avoided. First, for many years now, budget allocations of the Philippine government for public education have remained at levels far below standards set by UNESCO (at least 6% of GDP) and the World Bank (at least 20% of the national budget). Even without K-12, public schools already faced a severe lack of facilities, books, and teachers. K-12 budget requirements for 2014-2019 are estimated to reach USD 4,410 million, and even now the government foresees a deficit and is negotiating with such banks as ADB for USD 100 million to fill the gap. Thus, ironically, K-12 will worsen budgetary constraints and resource shortages for public schools, greatly affecting the quality of education and participation rates, in addition to pulling the country more deeply into debt. Second, with budget limits as a foregone premise, the additional K-12 burden will have to be shouldered one way or the other by the students and their families. This year (2015-2016), 1.4 million public school students in 4th year high school who under the old system are supposed to graduate will be forced to choose whether to undergo two more years (Grades 11-12). If they opt to take the additional years, they will need an estimated PHP 30,000 (USD 660) per student per year, greatly straining their parents’ budgets. The alternative is to forego college and to job-hunt instead as disadvantaged high school dropouts—exactly the situation that K-12 is supposed to avoid. Third, K-12 will deepen the privatization of the educational system. Of the roughly 1.95 million students in public and private schools who are expected to finish 4th year (Grade 10) this year, only around half can be absorbed by public high schools offering Grades 11-12. The other half will have no choice but to shift to private schools or state universities and colleges offering Grade 11 (typically at higher tuition rates even compared to 1st year college tuition), or to join the swelling ranks of out-of-school youth. The Aquino regime offers two quick fixes that will only hasten privatization and invite corruption: (1) the “SHS voucher system,” which is basically a partial subsidy to senior high school students to pay for their enrollment in private schools participating in the voucher system; and (2) a “PPP for School Infrastructure Project” designed as a private-public partnership in which private contractors are paid by the government to build more classrooms under a build-lease-program. The two schemes are under the Education Voucher System and the Education Service Contracting, respectively, which in turn are thinly veiled privatization schemes under the World Bank-supported Government Assistance Program to Students and Teachers in Private Education (GASTPE) program. The management of GASTPE had long been contracted out by the Department of Education to the Private Education Assistance Committee (PEAC) of the Fund for Assistance to Private Education (FAPE). The GASTPE budget allocations, which were insignificant in the 1990s, rose to Php 20 billion in the nine years of the previous Arroyo regime, ballooned to Php 34 billion in the first five years of Aquino misrule, and will increase to a whooping Php 20 billion in 2016 alone. The cost of government subsidy to private education has become so staggeringly huge and so susceptible to abuse that the Commission on Audit, which is not even authorized to audit GASTPE, has questioned the whole privatized arrangement with PEAC-FAPE. Aquino’s K-12, intentionally or not, is also poised to significantly reduce teaching positions in colleges due to the expected drastic drop in freshman college enrollments in the next two years. It is estimated that 78,000 college teachers and employees will lose their jobs or be downgraded to high school teachers receiving lower pay—if they are absorbed into SHS level jobs. This displacement alone exhibits the height of planning incompetence and disregard of labor rights. All in all, Aquino’s K-12 represents a worsening of the Philippine educational crisis and the government’s disregard of the people’s right to education in the face of the neoliberal offensives. Following the dictates of US-led impositions in education will not solve the Philippines’ serious unemployment problem and increase the job security of Filipino workers, which are rooted in more fundamental problems of underdevelopment such as the absence of genuine industrialization and land reform. If the government’s track record in public education is any indication, Aquino’s K-12 will only turn into a new area for privatization and PPPs, foreign loans, and corruption, while K-12 graduates who enter the labor force will continue to face the same problems of severe unemployment, depressed wages, and the vagaries of labor migration. Theoretically, a K-12 program, properly oriented, planned and managed, could lead to genuine reforms that will truly benefit the Filipino people and youth in the realm of education. A truly patriotic, mass-oriented, and scientific educational system will be able to train millions of youth, help empower the people and build their nation through heightened social consciousness, scientific knowledge and technical skills—while also contributing to the general advance of human knowledge and development worldwide. The Aquino clique’s K-12 is bound to fail because of blind obedience to their neoliberal masters, and their own mispriorities and incompetence. The International League of Peoples’ Struggle calls on the people of all countries especially in the Asia-Pacific region to expose and oppose the US-led neoliberal offensives lurking inside and around the APEC. We particularly call on the Filipino people to organize and mobilize in study meetings and protest actions to help in the thorough exposure of key APEC meetings in Manila and other Philippine cities, together with their expected outcomes. We particularly call on the Filipino youth to continue to expose and oppose the various schemes of neoliberal “reform” in education, and to fight for a patriotic, scientific and mass-oriented system of education interconnected with national industrialization, agrarian reform, and democratic rights-based governance. Among the tasks of the Filipino youth-student movement are to serve as a propaganda movement for nationalism and democracy, to go deeply among the masses of workers and peasants, and to reach out to their compatriots studying and working abroad, as well as express solidarity by strengthening ties with their counterparts in the global anti-imperialist youth movement.